The number of green sea turtle nests in Florida this year was more than double the count of the previous highest year. Biologists with the Florida Fish and Wildlife Conservation Commission (FWC) have documented more than 25,000 green turtle nests on 26 index beaches in the state in 2013. FWC-trained and authorized surveyors across the state monitor nests on a set of index beaches that span nearly 250 miles and are the focus of the Index Beach Nesting Survey. These surveys began in 1989. Index surveyors follow firm counting guidelines, making it possible for FWC researchers to use the data from these beaches to identify trends. The trend for green turtles shows an exponential increase in nesting over the past 25 years. In 1989, biologists documented only 464 green turtle nests on index beaches. In 2013, this index nest count was 25,553. The index count represents about 70 percent of green turtle nesting statewide. Leatherback sea turtle nest counts have also risen dramatically over the past quarter century. However, the 2013 count of 322 leatherback nests on index beaches was 193 lower than last year. Loggerhead sea turtles, the most prevalent sea turtle species on Florida’s shores, accounted for 44,810 nests on index beaches this year, down from 2012’s near-record count of 58,172 nests. 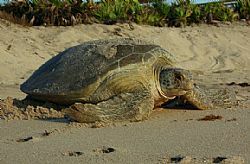 Although this federally threatened species nests on the same beaches as green turtles and leatherbacks, loggerheads have not shown the recovery in numbers seen in nesting by the other two species. The high level of loggerhead nesting last year followed a pronounced drop in the species’ nest counts between 1998 and 2007. Hundreds of surveyors from conservation organizations, universities and federal, state and local governments – along with other volunteers – make possible the extensive data collection on Florida’s nesting sea turtles. In conjunction with the Index Nesting Beach Survey, the Statewide Nesting Beach Survey documents sea turtle nesting on nearly all sandy beaches in Florida. Data from the statewide surveys will be available in early 2014. The FWC's role in coordinating Florida’s sea turtle nest counts, training surveyors and compiling data is funded by the U.S. Fish and Wildlife Service and sales of the state's sea turtle license plate. Florida residents can purchase the plate to support these efforts at BuyaPlate.com. For more information about trends in sea turtle nest counts, visit MyFWC.com/Research, click on "Wildlife," then click on "Nesting" under the "Sea Turtle" heading. Report sick or injured sea turtles to the FWC’s Wildlife Alert Hotline at 888-404-FWCC (3922).